The Free Press’ Geoff Kirbyson makes a crack about starting Fight Club after Canwest, but Asper misses it. Getting serious, Asper reflects on Canwest’s bankruptcy, and the people who lost employment. Kirbyson asks Asper the first moment he saw signs of trouble. Asper on first signs of trouble: No one cliff you drive off, series of events. Asper says advertising profits started to fall at Canwest in Sept 08. The News Cafe is a different beast. This is no studio audience. As Asper describes Canwest demise, two men at the back of @wfpnewscafe continue to shoot the --it. Dan Lett, political columnist the Free Press who co-ordinates content at the News Cafe, isn’t surprised by this. @mel_coulson Welcome to the completely uncontrolled environment that is @wfpnewscafe. Asper blames the banks for Canwest’s undoing. When new bondholders came on board in Oct '09, Asper said he knew Canwest going to war. Kirbyson asked Asper if he would have done anything differently to save Canwest. There wasn’t a bank to bail Asper out, which was flailing in loan repayments. Not one financial institution in the world was able to lend $$ to any company. Asper says it became a battle of shareholders vs. creditors. We didn't say we have this for them, we said we had to save for us. Kirbyson asked Asper what many have wondered: how does a son feel about being at the top of a dynasty his father created, and watching it collapse? Asper says he can't have discusison with himself about whether he failed dad in company's collapse. Again, at the News Cafe, anything goes… reporters find themselves under as much scrutiny as the interviewee. Remember, Kirbyson is not a studio interviewer. He’s a reporter doing his job as he would everyday in the Free Press newsroom – but in front of cameras and a live webcast. That leaves him open to being heckled. Kirbyson asked Asper if buying the newspaper chain led to Canwest’s undoing. Kirbyson asked him to reflect on the legacy of Canwest. Kirbyson asked Asper what he saw as the future for media. Asper predicts radio will survive. 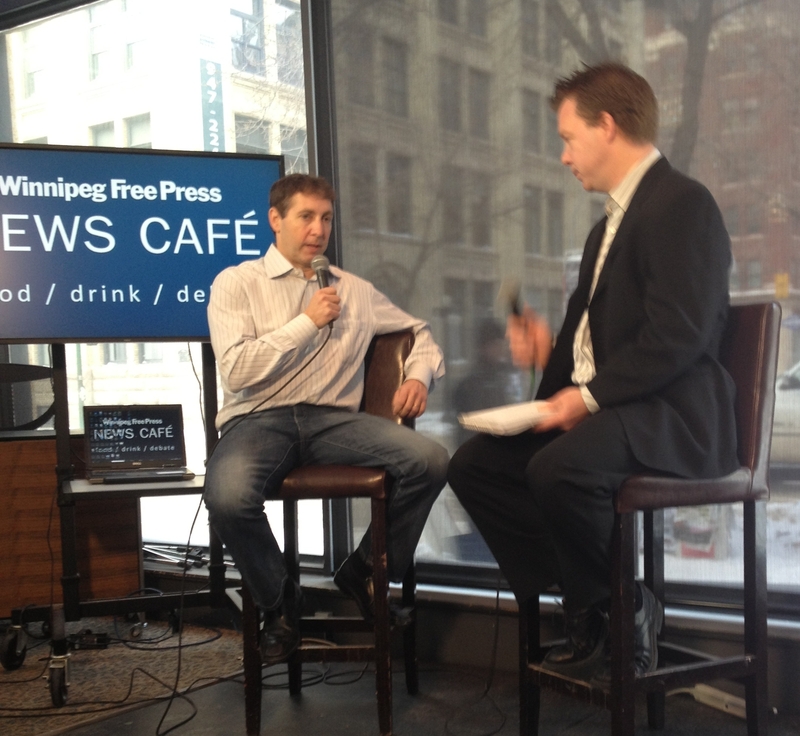 After the interview, Asper sits down with Geoff Kirbyson at the Free Press News Cafe for a sandwich. I’m one of the pressmen from the Edmonton Journal that just lost my job and now it is happening to Calgary and Vancouver. Leonard has no one to blame but himself. After his dad died he drove that company into the ground. He is not a business guy. He is a magot!! !